One of my main goals when starting this blog was to bring you trends early enough in the season so that shopping was made easier for all of you. So with that said, it might be raining cats and dogs outside, but the stores and runways are screaming SPRING. Pale pinks, neutrals, peplums and distressed denim & tees are going to be seen EVERYWHERE this upcoming spring season. And guess what? I’m here to help you get ready for it. CHAMBRAY – You know how chambray tops were a hit last year?? Well don’t give yours away to Good Will just yet. The chambray/denim on denim trend isn’t going anywhere. Do yourself a favor and get yourself a REALLY good chambray or denim shirt (if you don’t have one already), and make sure it fits you well. This will be a closet staple for you this spring season. My go-to chambray tops are these ones from Madewell. They fit you in all the right places, are perfect tucked in or not and pair perfectly with distressed white denim like these & my absolute favorite crossbody bag. STATEMENT EARRINGS – Get ready to see big, bold and colorful statement earrings all over the place because simple studs are out and chandelier earrings are in. I’m loving these blush drop statement earrings from BAUBLEBAR and the Nile Chandeliers from Stella & Dot. Neutral colors that match with everything spring and so easy to wear. WEDGES – A good spring wedge never goes out of style. Wear them with a floral dress or with skinny jeans and a pretty off the shoulder top. A great versatile shoe for the season. If you haven’t got your hands on these gorgeous wedges, I highly recommend the investment. One of those well made leather items that will last you a lifetime. Don’t want to spend that much money on a pair of shoes? These ones are basically one third the price and pretty much identical. CHOKER TEES – If you follow along with me on any of my social media channels you know that I’ve been wearing the heck out of choker tees, tanks and sweaters. They are a HIT right now. If it has a choker cut out, I love it. End of story. Style a choker graphic tee like this one here with some amazing distressed denim & blush booties and you’ve got yourself one super adorable outfit. BANDANA KERCHIEF – Oh yes. You read that right. If there is one thing that screams Parisian style, its the kerchief. Hint why I love it so much. I can just picture myself in a couple of months roaming around Europe in a denim a-line shirtdress, a fun bandana kerchief and a gorgeous wedge shoe like this one here. Oh, and I won’t forget to top it off with my favorite sunnies. PEPLUM – Another hit from last year that isn’t budging. These peplum tops are a must have in your closet AND they are on sale for under $25! 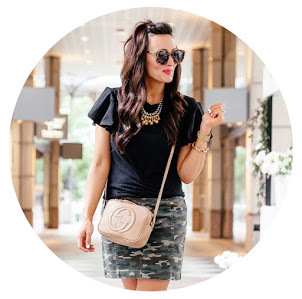 I love pairing a simple peplum tee with a big statement necklace on those days when I’m stumped on what to wear. Such an easy yet stylish outfit. Are you ready to shop spring now?! I sure hope so because I’m SO ready!